We’ll explain thoroughly the results of your HRV Analysis. The Heart Rate Variability Analysis (HRV) evaluates your vital functions. 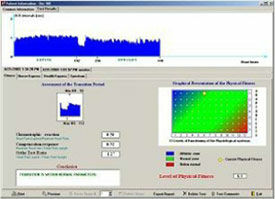 The fitness analysis is a non-invasive, computer-based program designed for assessing your Autonomic Nervous System (ANS) and general health. It works by consistently measuring and monitoring the change in your physical and emotional well-being over a period of time. Its purpose is to determine your overall state of health by computing your physical fitness, wellness and day-to-day functional capacity. This in turn, helps to determine your physiological age rather than your chronological age. This assessment helps to optimize your nutritional and chiropractic program, as well as evaluate your energy, stamina, and general physical and emotional well-being. It is an ideal tool for wellness assessment and improvement. Contact us today to learn more about how a HRV Analysis can help you on the road to better health.